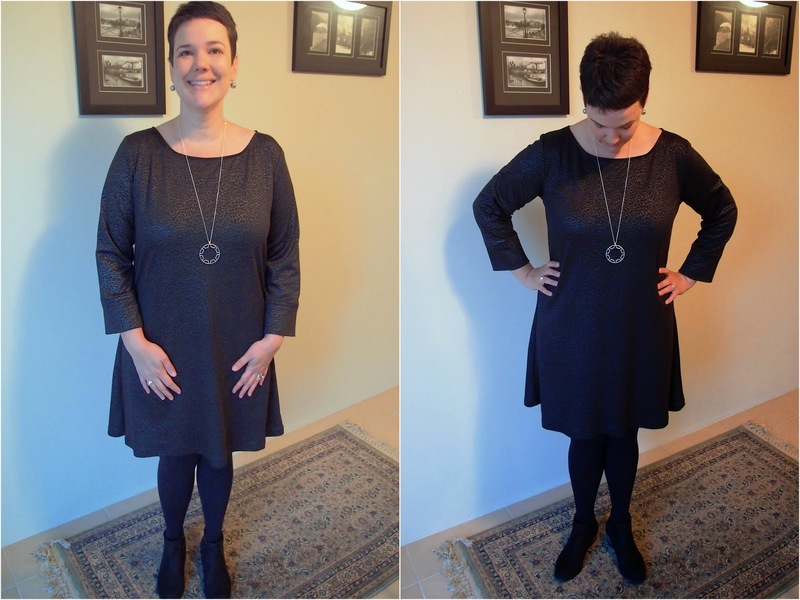 I got stuck straight into my second Coco Dress once I'd set the last stitch of my ugly poo-brown version. I'd actually bought this fabric from fabric.com with a pair of groovy Anita Ponti Pants in mind - but the pants are on hold until I can work out how to heighten the back rise (which I will do in an upcoming class with Silva at Tessuti). 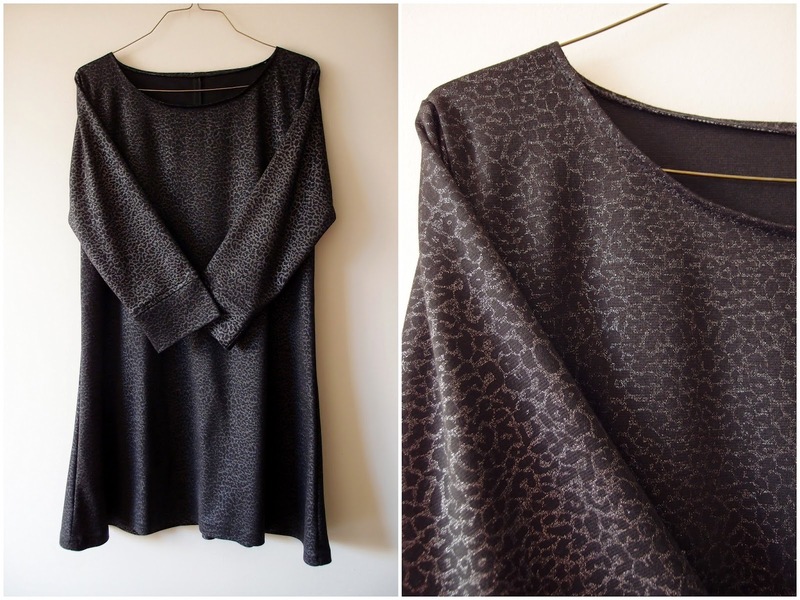 It's a pretty wild print - a black fabric with a silver glitter cheetah print! The glitter means I couldn't iron on the right side of the fabric without a piece of muslin over the top...but it was a small inconvenience for something so bling-a-licious. As you can see I've eliminated the funnel neck on this version and I think this is a much better look for me. I had a bit of trouble turning the neck down though as I added in some iron-on stabilising ribbon "stuff" I bought from Tessuti and the neckline lost all its stretch (also making it not 100% comfortable in that area and it sort of pulls on the shoulders). The neck is also not very neat which bugs the bejesus out of me! Overall I'm fairly happy with my finished dress but I'm not sure that I love it due to some fitting issues. I'm not sure that I'll wear it all that often, but only time will tell. It feels more like a "going out at night dress" rather than a "wearing to work dress", but that's OK as I actually go out to dinner quite a bit. You can see on the photo below that there is a bit of excess fabric around the top of my arm/above my bust. It makes the dress feel a bit big but I'm not sure how to get rid of this. I think the top of the shoulder seams are also a tad too big as they drop off my shoulder a bit...I wonder if I should size this area down on the pattern (but would that make the arm hole too tight)? I'm finding the dress really uncomfortable on my right shoulder (which is my "sore" shoulder)...perhaps if I eliminate the neck stabilising "stuff" it'll have a bit more give to it? My main "issue" with the fit on me is the excess amount of fabric on the back of my dress - above my bum. You can see the fabric pooling at my shoulders, and then also pooling in the curve of my lower and upper back. I'm sure the issues with pooling at my lower back can be fixed with a swayback adjustment...so I need to work out how to do that. Not sure what to do about the pooling around the shoulders....if I fiddle with this area too much I think I risk making the dress to tight on my arms/chest. I had to add a back seam in to the dress as I didn't have enough fabric to cut both the front and the back on the fold. I'm really pleased with how this worked out. I even topped stitched the seam down so it's super neat (AND my line of stitching is pretty much straight - winning). I decided to add cuffs to the sleeves again as I think it's a really tidy finish. I LOVE them...though next time I think I'll taper the sleeve in a bit as both the sleeve and the cuff feel too loose. I'm not sure why I am having so many fitting issues with this pattern (and let's face it, every pattern I've ever attempted). From all the reviews I've read on line seem like straight forward sews, and I haven't spotted any of the fitting issues on any of the (million) photos I've been stalking on Google. WIN! Well close enough anyway. I get a similar issue at the back sometimes which results from the garment being too long in the body and so where it should be flaring out again for my hips it is still the level of the waist, then causing the waist to sit on my waist and bunch up (if that makes sense). Not sure that would be the issue with you though, I think you are much taller than me? Perhaps you might need a little more width in the back below the waist? Fitting issues- we have all been there! You are not alone! Every body is so different and those that have been sewing for a long time, often have standard alterations they do to all there patterns, so often they will forget to mention the changes they made when they post about a project. Oh my yes! You are certainly getting really good! Bummer about the sway back and the shoulders. I think though that you can get away with wearing this out on the town! those cuffs are the bees knees! You must be so happy with your skills getting better and we will conquer the fit issues.